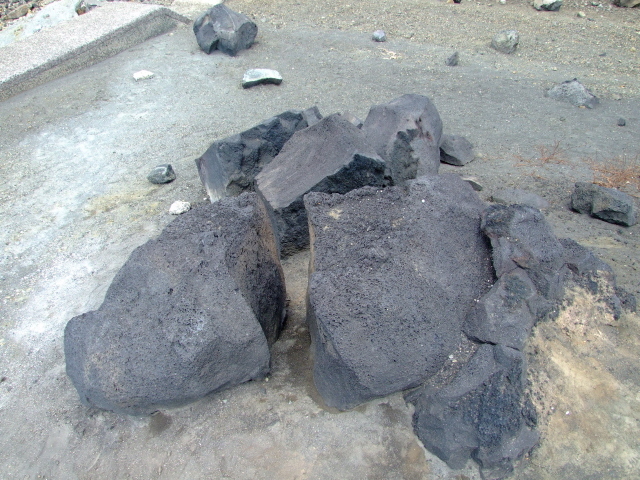 UPDATE 10 October 2016: I've just heard that Mt Aso has sprung to life again in an explosive eruption and that access to the mountain and the roads near it has been suspended for safety reasons. When (or if) it will reopen remains to be seen. If you're planning to go there do check ahead! 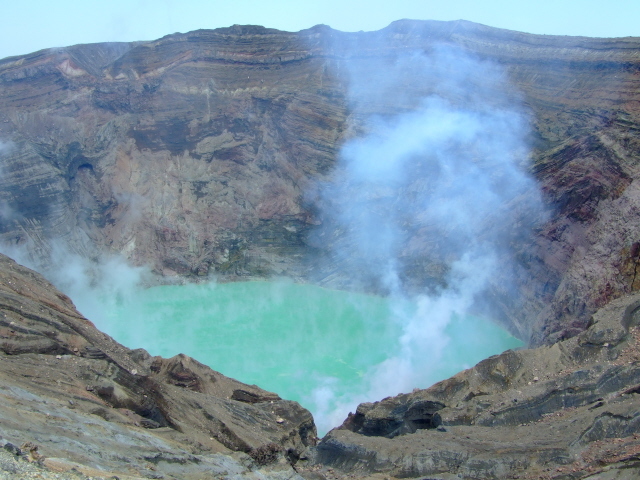 Aso is one of the largest calderas in the world (some sources say THE largest) and within it is Nakadake crater, one of Japan's touristically most developed active volcanic spots. 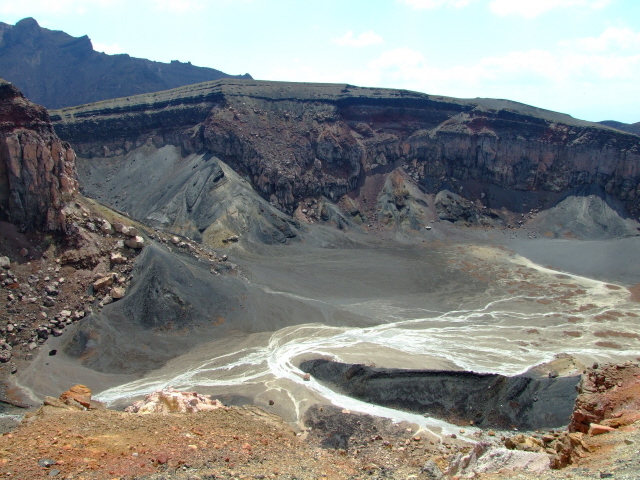 If the weather and the volcano's activity allow it, a trip to the crater rim is not to be missed. It's a stunning sight! More background info: Aso as a whole is actually as good as a whole mountain range in its own right: a gigantic caldera rimmed with mountains, some 65 miles (100 km) in circumference, with several small towns amidst fertile plains within, and volcanic peaks in the centre. Of these Takadake is the highest (over 5000 feet/1600m), but Nakadake steals the show because this is Aso's active crater and you can go right up to the rim. That is, unless volcanic activity and wind directions preclude it. But the infrastructure is there, including a ropeway (cable car) easing the final ascent for the scores of tourists that come here. 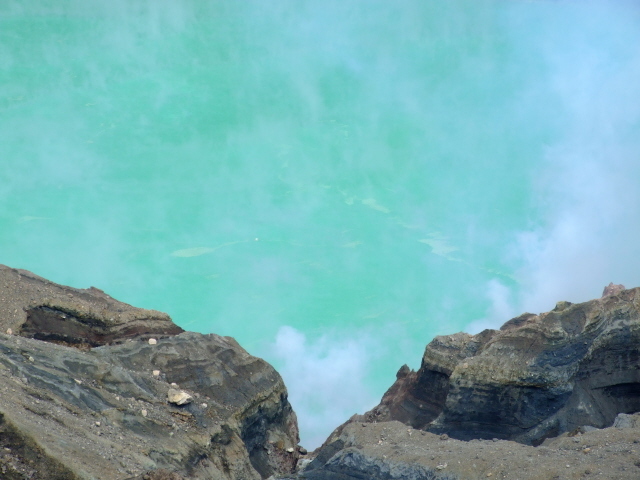 Most of the time, the volcano's activity is limited to emitting sulphurous gases from its eerie blue-green, seemingly boiling crater lake. 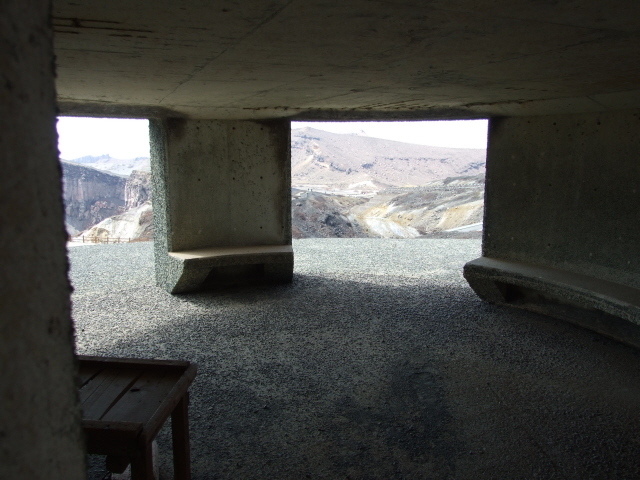 And as long as the wind doesn't blow those gases over the viewing platform side of the crater, access to this is allowed. Nakadake has had phases of moderate activity periodically throughout the 20th century, even for prolonged periods in the 1980s and 90s. But more recently has been comparatively well behaved. Only minor ash and mud eruptions have occurred in the last few years, the latest in 2005. 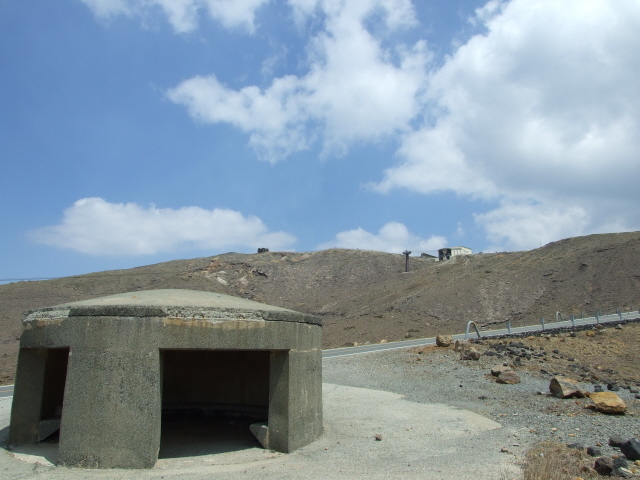 It remains volatile, though, and the series of concrete pillbox shelters provided all around the tourist walkways testify to a certain risk of a sudden eruption. 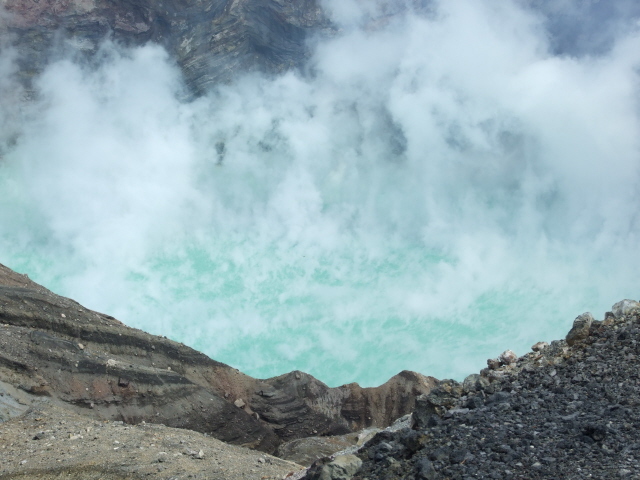 When Nakadake erupts, its lake usually evaporates while ash and lava bombs are flung from the crater. But afterwards the lake reforms as before. Its colour is not stable – and changes in the lake colour are one of the indicators of (threats of) activity. Aso is classed as a "supervolcano", that is: its destructive potential is enormous, though at the moment it's not deemed imminently at risk of any disastrously massive eruptions. What there is to see: If you're lucky and access to the crater rim is permitted, then it's a sight you won't forget in a hurry. It's truly awesome. 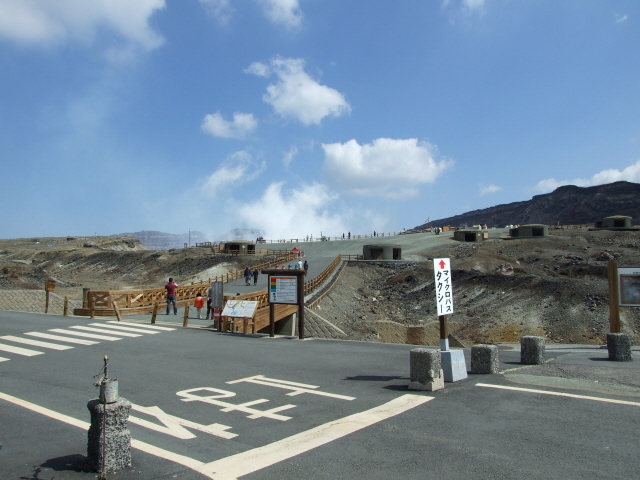 From the top station of the Aso ropeway (cable car) it's a short walk to the viewing platform with railings right on the crater rim. Information displayed on panels is multilingual – in Japanese, English, Korean and Chinese, which gives you an impression of the composition of visitors groups. Broadcast over tannoys in the ropeway & stations are multilingual too. Just off the rim are a series of low pillbox bunkers, massive concrete shelters to flee to should the volcano suddenly erupt without warning … This does make for a certain sense of "risk thrill". However, the volcano is being very closely monitored, so presumably the risk isn't really all that great. 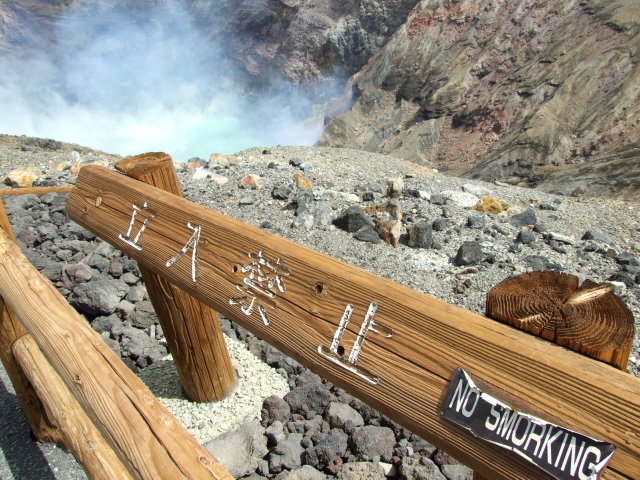 Still, warnings signs and announcements abound that people with asthma, other respiratory problems, or with heart diseases should not go near the crater so as to avoid exposing themselves to volcanic gases. There have been serious accidents, even casualties, as late as 1997. The viewing area follows the rim for about a hundred yards, allowing for only a slight variation in the viewing angle, and from its end hiking trails branch off into the volcanic wasteland that lies beyond. These lead past older craters that are now inactive, and also past some deposited lava bombs – which gives you an indication of their range. 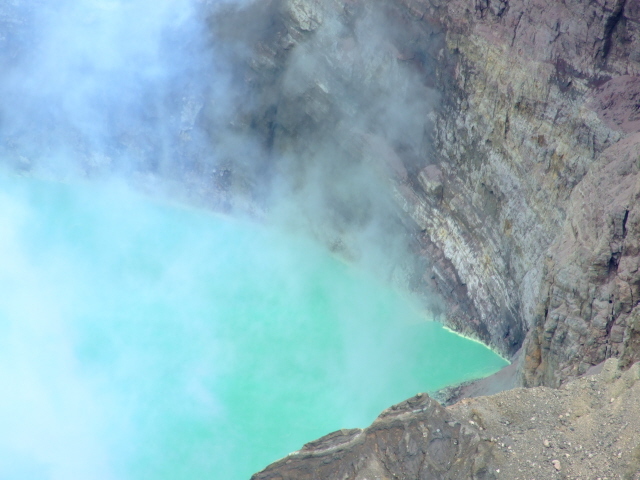 But the best bit, if the weather is nice and the volcanic fumes not too thick, is to look down into the bluish-greenish crater lake some 200 feet (60m) below the rim of the 330 feet (100m) wide crater. It's a sight that's difficult to drag oneself away from … for me at least. Apparently the colour varies somewhat, but when I was there it was an absolutely otherworldly hue, a real devilish broth! There were loads of coach parties and other tour groups, many of them Koreans, and I was baffled by how little interest so many of those other visitors showed in the volcano. Many just trudged past, granting the crater lake no more than a casual glance, just posed in groups for a quick snapshot and then off they went again, after just a couple of minutes … Incomprehensible to me – I couldn't get enough of it and probably spent something like 45 minutes up there and took way too many photos of the ever changing fume formations on the lake's surface. At times it's quite a show: sometimes the fumes form spiralling plumes obscuring the surface almost completely, sometimes they're billowing up only on one side of the inside rim, thus revealing the deep colour of the water in its full glory; plus allowing glimpses of the sulphur deposits on the edges of the lake and even some yellow swirls floating on the water. 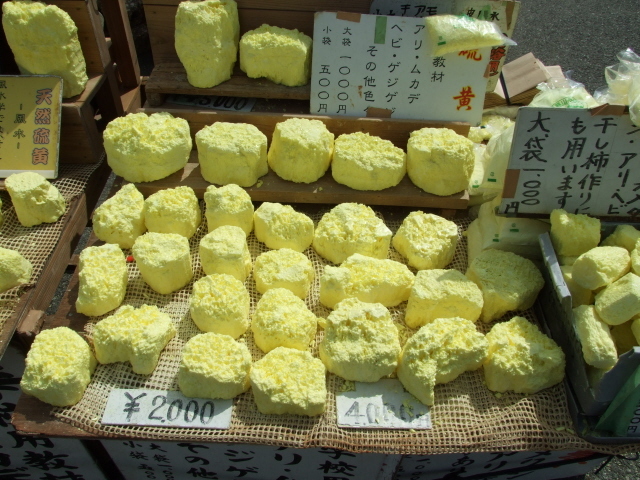 Speaking of sulphur: there are a couple of stalls by the crater rim that even sell blocks of deeply yellow sulphur. However, the Japanese vendors staffing the stalls made it quite clear that they would not sell me any sulphur ... indicating movement through air ... then I understood. If you're a foreign visitor travelling by plane, which will be the case for most foreigners, then you can NOT purchase any of these … presumably that would falsely alert sniffer dogs at airports. Sulphur is, after all, a component in some standard explosives. 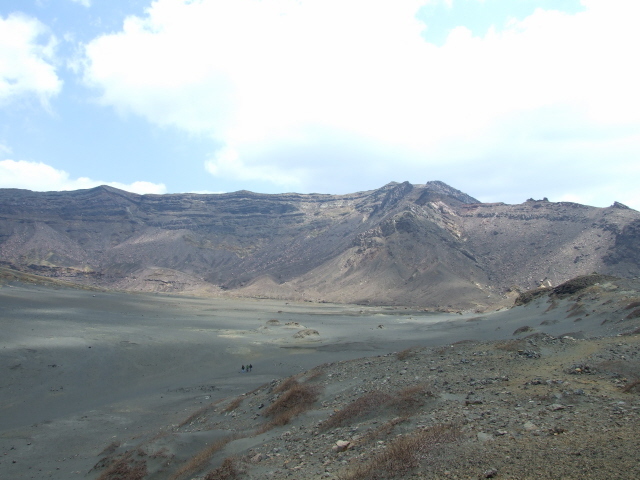 Once you do manage to drag yourself away from the view of the crater as such, the hiking trails are also well worth exploring, including some wooden walkways that make walking much easier than on the ash and lava. If you're really into getting the fullest hiking experience you could also climb all the way up to the crater rim, but most people will take advantage of the ropeway at least for the way up. But toddling downhill is quite an easy alternative to getting the ropeway down. At the bottom, in and around the ropeway station, the touristic commercialism is massive – its capacity for handling tour groups must be enormous. But when I visited, in April 2009, it wasn't intolerably crowded. I Had been prepared for it and never expected to have the place just to myself anyway – it won't happen, it's way too popular – but it was alright really. And anyway, given the speed with which most tour groups were rushed past this site, you'd never have to wait more than a few moments for the throngs to ease. 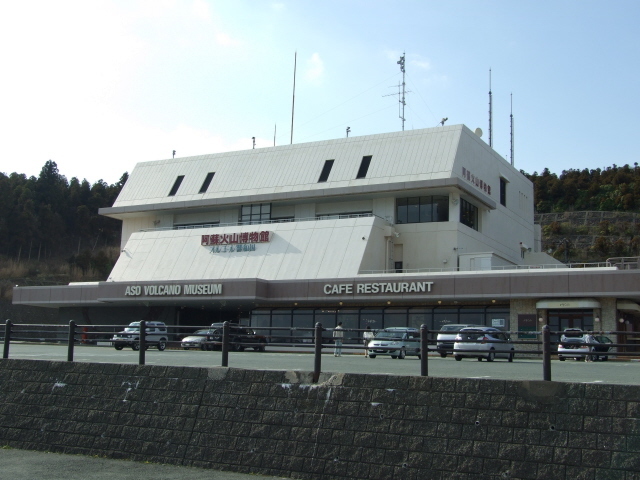 If you walk a few miles down the road, or along a more peaceful trail that runs more or less parallel to the road, from the lower ropeway station you will come to another touristic centre: namely around Aso's "Volcano Museum". The latter is worthwhile at any rate, but on days when access to the actual crater is denied it provides the only real substitute: inside, amongst various volcano- and nature-related artefacts (some a bit dated) as well as video footage of Nakadake's (and other volcanoes') eruptions is also a screen onto which live pictures from a camera inside the crater are projected. And from a control panel you can direct the camera in real time as well! Pan, tilt and zoom in or out. There's also a huge cinema in which a short film rather too eagerly advertises the touristic value of Aso. I didn't quite understand why it would do that: the fact that you're sitting there watching this rather suggests you don't need any more convincing through such heavy-handed marketing for coming here. The film does also include some dramatic footage of eruptions too, though … so it's still worth watching it. Bizarrely, there's a "music box museum" (and shop) attached to the Volcano Museum. If there's any connection between the two themes, volcanoes & mechanical musical machines, then it utterly escapes me. A lot more additional tourist merchandise, on an even more massive scale than at the lower ropeway station, surrounds the two museums. You could certainly search out some kitschy souvenirs here … but it's bordering on the intolerably over-touristy. 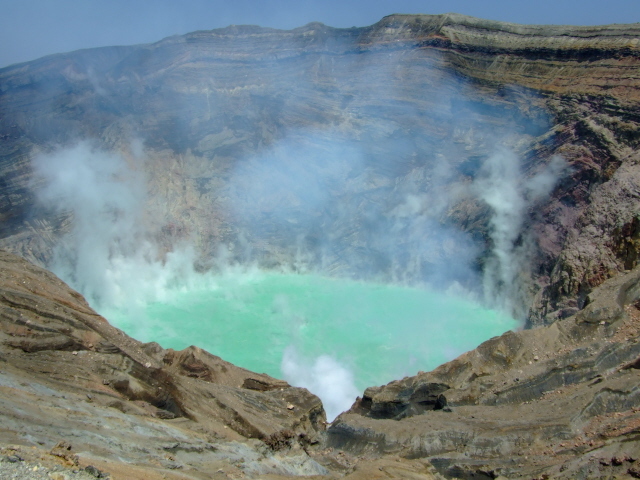 For an extra-extravagant experience you can also take a short scenic flight in a small four-seater helicopter over the crater. These depart from a meadow by the road up from the museum to the ropeway and cost some 5000 Yen. Flights last only a few minutes, but allegedly allow a spectacular bird's eye view over the crater and its environs. Location: at the heart of Japan's southernmost main island Kyushu – some 25 miles east of the town of Kumamoto, and some 80 miles north of Kagoshima. Access and costs: not necessarily easy, but doable – combined costs for transport, ropeway (cable car) and museum admission pile up a little, but not too extortionately. Details: The Volcano Museum is open daily from 9 a.m. to 5 p.m., admission 840 Yen – hefty, but to be expected at such a marketed site. The ropeway (cable car) that takes visitors up the last steep stretch of the ascent to the crater rim costs 600 Yen one way, 1000 Yen both ways, hours of operation: 8:30 a.m. to 5 p.m., the last trip up is at 4:25 p.m.; prices as in mid-2009 (likely higher now). Both places offer various reductions for groups and minors. The crater itself is free if you're prepared to climb all the way. But you'd still need to get to the base. And transport is another issue. There are Kyushu Sanko tourist buses (heading for "Aso-san nishi eki") taking independently travelling visitors from Aso train station to the Volcano Museum and/or the base station of the ropeway; every one to two hours, one-way fare: 540 Yen, journey time 30-40 mins. If you have your own car you can drive all the way up to the ropeway base station or even all the way to the top – but that last stretch is a toll road (560 Yen). The easiest way of getting to Nakadake is probably to take one of the excursion tourist buses that operate from Kumamoto, there are also some that then go onwards to Beppu. But these tourist excursions don't allow sufficient time for both hiking around the crater and a visit to the museum, unless you join the extremely rushed nature of some tour group visits … and of course you cannot avoid the group dynamics. The same holds for round-trip packages of Kyushu (typically from Fukuoka in the north of the island), but such arrangements would at least make the logistic easy. [Special tip: if you're intent on travelling independently, the perfect way of doing Aso, in my view, is this: if you have the time and aren't on too tight a budget, stay at Pension Angelica in Takamori. Takamori is a small town on the south side of Aso reached by a scenic private railway, called Minamiaso Tetsudo, which branches off the main Japan Railway line across Kyushu at Tateno station. The side trip costs ca. 500 Yen one way. If you stay at Pension Angelica, they will pick you up from Takamori station and drive you to their place – which is a splendidly hospitable place, at perhaps an unexpected location. Tatsuji Shimokawa, who runs the pension, is a wonderful host. It's almost a real family home-stay atmosphere. And the cooking is outstanding too – they do dinner, bed & breakfast deals, and the dinner included (five to six courses) alone would be worth the price. You can spend more than that on a single meal in many restaurants across Japan, and here you get a nice room, breakfast, personal service, great views, etc. thrown in on top! They adapt to your special wishes too. My wife and I had Tatsuji's European-style cooking the one evening, all semi-vegetarian (mostly fish-based) at our request, even though they pride themselves on the quality of the local beef. It was gorgeous, better than a lot of European fine dining experiences I've had in Europe! Then the next night we had an outstanding Japanese dinner (apparently prepared by Tatsuji's mother). On the morning of the whole day in between, we were taken by car (Tatsuji's dad does all the driving) to the ropeway base station at Nakadake in the morning, and picked up 30 minutes after a quick phone call at the end of our excursion in the late afternoon from outside the Volcano Museum. The extra chauffeuring only cost an extra 1000 Yen – you'd pay more than that for the inconvenient bus journey from Aso station and back. There's also free Internet access at the Pension, though Tatsuji would check e.g. current crater accessibility online for you too before you even think of it. And to round it all off, the Pension also has its own small onsen (Japanese hot spring bath) for use by guests at no extra cost. Time required: that seems to vary a lot … some tour groups allow hardly any time at all, while independent travellers (Europeans in particular) made a lot more of the area. As for myself, I spent two hours at the Nakadake crater and on the hiking trails around it, it took another hour or so for the hike down, then I stayed about an hour in the museum: Add to this extra time for exploring the scenery beyond (and the shops), and you're looking at half a day at least. Travel time has to be added to this, of course. And for more serious hiking significantly more time can be spent in the area. There are various hiking trails, though the north side of Nakadake is currently not accessible, and you could even go all the way down to the valley. 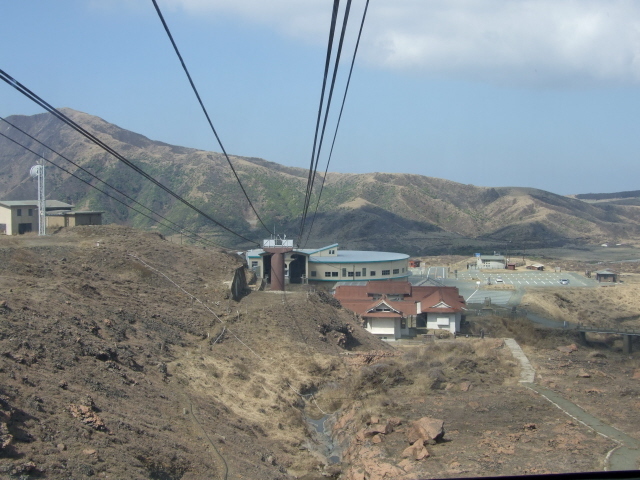 There's also another ropeway to the north-east of Nakadake. In total, then, you can easily spend an entire day or two here. Combinations with other dark destinations: None in the vicinity, but Kagoshima with its own active volcano, Sakurajima, isn't too far, about an hour's train ride from Kumamoto. And from Kagoshima, excursions to the Kamikaze Museum at Chiran can be undertaken. Further away, on the western cost of Kyushu, is one of dark tourism's top destinations in Japan: Nagasaki, it's within half a day's travel reach from Aso. 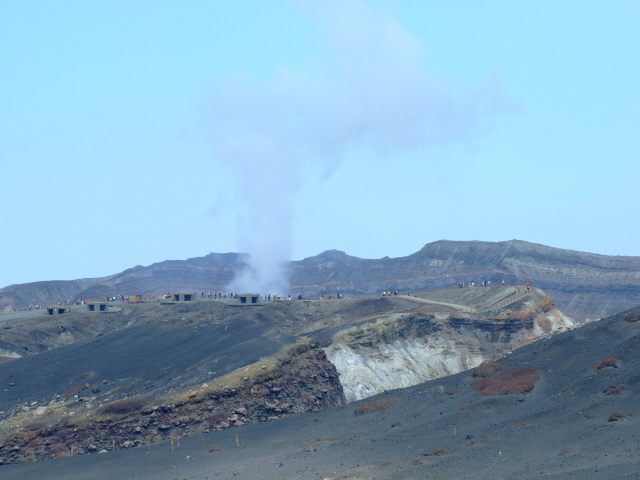 There are also various hot springs in the Aso caldera itself and beyond – esp. at the hot spring resort of Beppu on the east coast of Kyushu, reachable by train from Aso on the same line that comes from Kumamoto. Kumamoto itself sports (the reconstruction of) one of Japan's largest castles.